Hi guys! 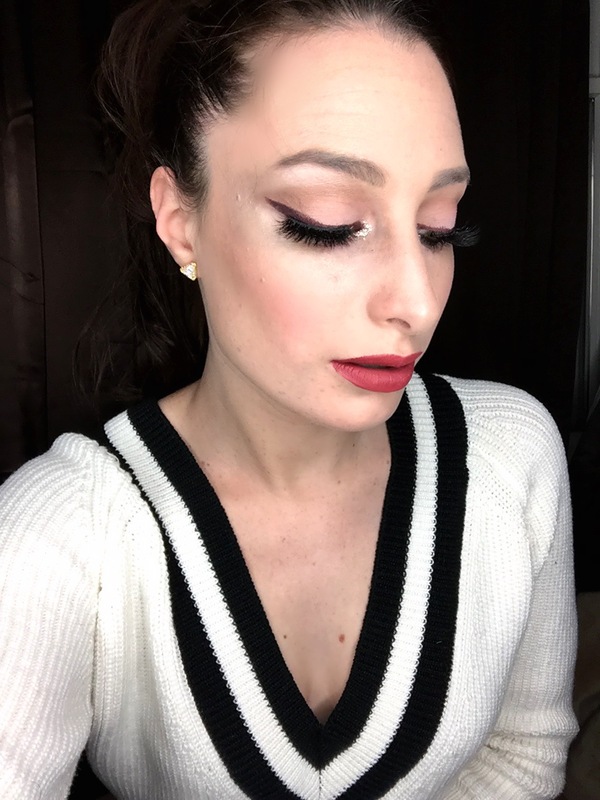 I just wanted to get on here and post a quick New Year’s Eve makeup look. 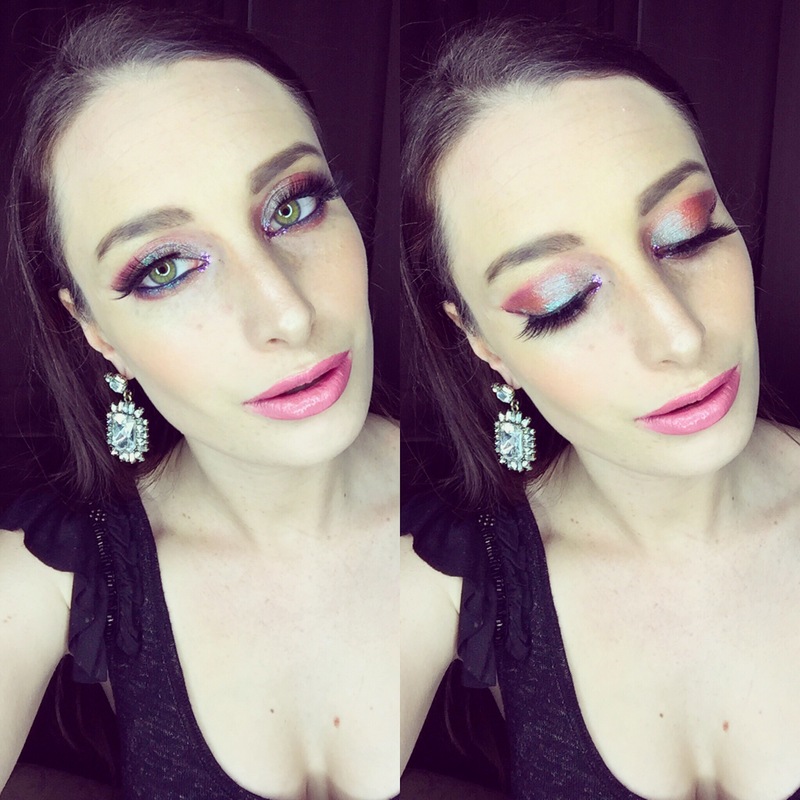 I’m hoping to have a super sparkly look up tomorrow using Makeup Geeks new Sparklers (my main review blogger, Temptalia, didn’t give them too promising a review, so we shall see how they work). Anyway enjoy your New Year’s Eve; thank you for supporting my blog this year. Makeup details are below. 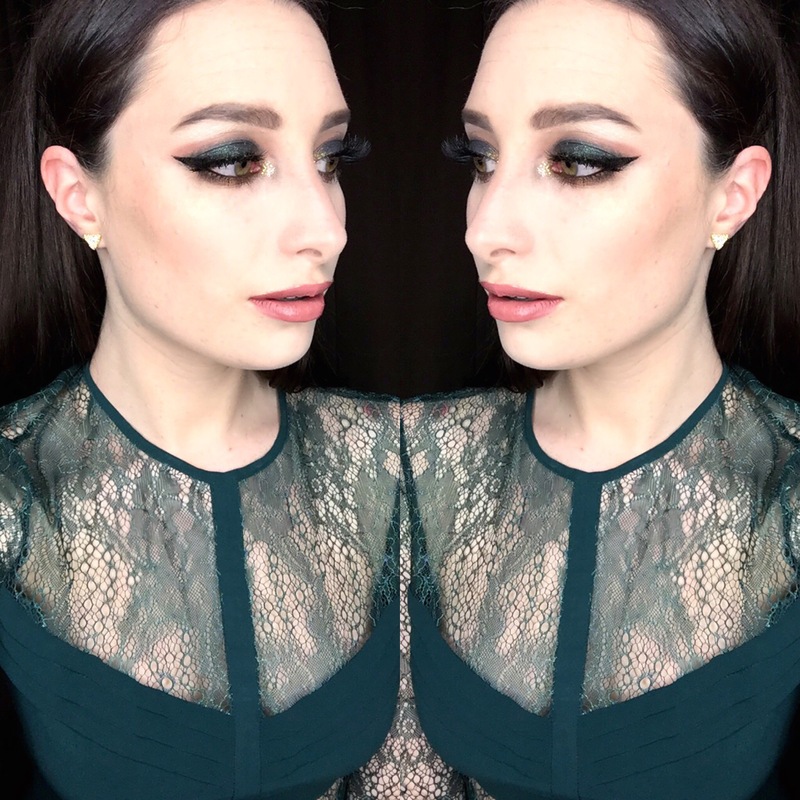 Holiday Makeup Look: The Grinch Isn’t the Only One Who Should Wear Green! December 25, 2015 .Reading time 2 minutes. Happy Holidays everyone! This is the look I wore this Christmas Eve, and if anyone has any formal or fancy Christmas plans this would be a great look to try (my family’s X-mas day is a bit more casual). This would also work for New Year’s Eve or a date night! The makeup details are below; I’ll also have some NYE makeup looks and my favorites of the year coming up soon. Brows: Anastasia Dipbrow in Dark Brown, used Tarte’s Amazonian Clay Brow Brush. NYX Brunette Brow Mascara on top. Crease: Browns and oranges from the Morphe 35N palette. Used a medium tone brown all over the crease and a more orange/brown in the outer crease. Inner corner: Colourpop Thirsty Girl Supershock Shadow in the inner corner with MAC’s Gold Glitter on top in the inner corner. Browbone: LORAC Mega Pro Vanilla and Opal mixed. Lower Lashline: Too Faced Stardust Palette Showgirl and Jackpot in outer corner. Blended with Anastasia Beverly Hills RTW from the Catwalk Palette. Mascara and Lashes: L’Oreal Carbon Black Telescopic and Velour Lashes for Sephora Fluff n’ Whispies. Highlighter: Bobbi Brown Highlighting Powder in Bronze Glow on the cheeks. The Balm’s Mary Lou-minzer on the nose, cupid’s bow and above the brow. Lips: NYX Slim Lip Pencil in Ever (filled in the whole lip and lined) topped with Bite Beauty Matte Creme Lip Crayon in Glace and Colourpop Lippie Stix in Skimpy in the middle. Extras: Dress- Asos. Earrings- Francesca’s. December 19, 2015 .Reading time 3 minutes. This season I’ve really been struggling with holiday makeup looks; now I love a classic red lip and shimmering gold eye as much as the next ornament obsessed girl but let’s face it, it’s not quite innovative. For Christmas Eve, I’m already planning an emerald-green eye, I’ll be sure to post and try to get this up early for anyone who wants to wear it that day! Anyway, this leads me to today’s look. 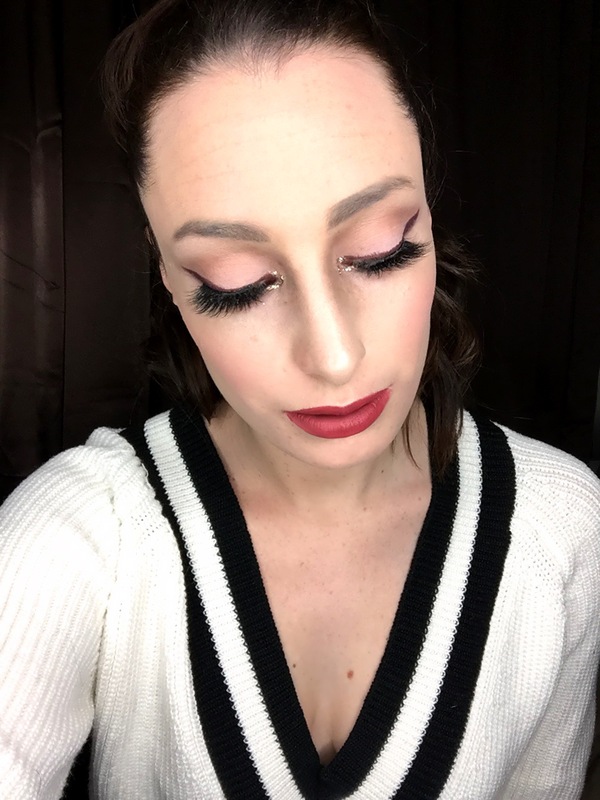 This makeup was really inspired by Colourpop’s Creme Gel liner in the stunning Best O, which is a burgundy shade to die for. 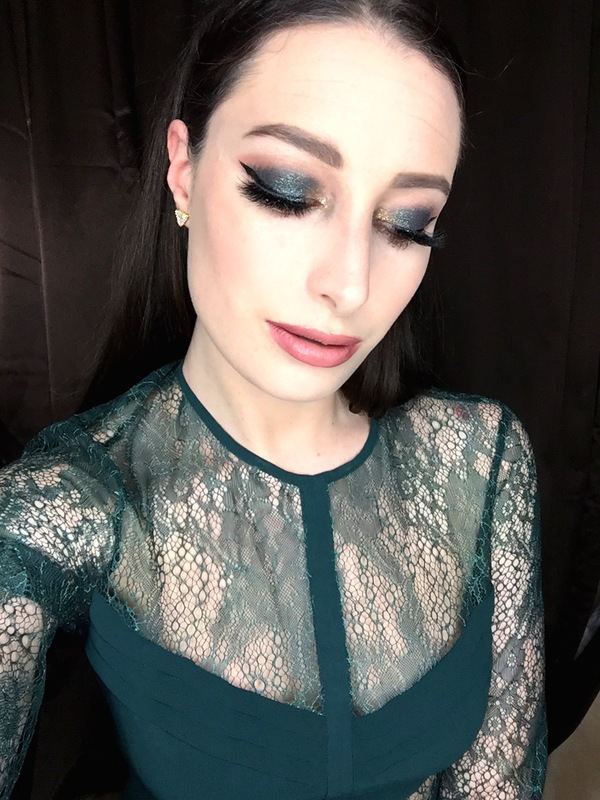 I especially love this color on green eyes, and honestly it’s what I’ve always wanted MAC’s Cocoa Riche liner to look like but it really doesn’t (BTW Colourpop makes Best O in a matte liner). I think this liner is an edgier, yet softer option than black especially for holiday parties. Below are all the deats for what I used for this whole look! Lashes: Velour Silk Lashes for Sephora in the style Fluff n’ Whispie (These are stunning and so, so comfortable. I want the whole line, that’s how much love I have) Also, I always use House of Lashes lash glue, the best by far. Highlight: The Balm Mary Lou-Minzer, applied on top of the cheeks, nose, cupid’s bow, and above the eyebrows. Lips: OFRA Cosmetics Long Lasting Liquid Lipstick in Pasadena and Santa Ana (you could probably just use Santa Ana, as it basically covers over Pasadena). Let me know if you’d like a review on OFRA! Extras: Sweater- Forever 21. Earrings- Francesca’s.